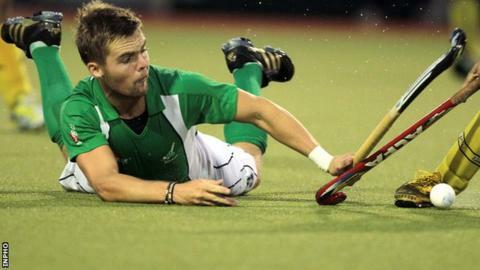 Ireland's men suffered the second defeat of their Champions Challenge I campaign on Sunday, but the Irish women drew 2-2 with South Africa in Glasgow. Maurice Elliott's 37th-minute goal was not enough to prevent Ireland going down 2-1 to Poland in Malaysia. The men lost to New Zealand by the same scoreline on Saturday and play Japan in their final pool game on Tuesday, ahead of the quarter-finals on Thursday. Naomi Carroll and Audrey O'Flynn were on target in the women's opening match. They face Spain in the second fixture of their campaign on Monday. Steve Edwards put world ranked number six New Zealand ahead on 11 minutes of Saturday's encounter, before Alan Sothern levelled for the Irish four minutes later. Bruce McCandless went close to putting Craig Fulton's side ahead before half-time before Hugo Inglis restored New Zealand's lead a minute after the restart.